This J.P. Miller Damascus Hunter is a fine example of his work, specializing in reproductions and interpretations of antique knife and weapon designs. The hand forged 4.375-inch Cable Damascus blade is made of 1095 and 15n20 high carbon steels. The handle is Sea Cow Bone. 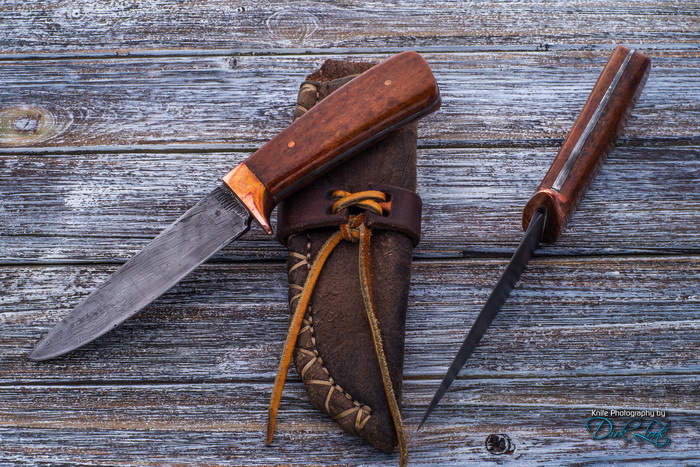 The knife is 8.5 inches overall length. The 10 oz. cowhide hand-stitched sheath is covered in Buckskin. I began making knives in 1965. I started making hand forged Damascus in 1977. I joined the Knifemakers Guild in 1982. I make carbon steel knives using 1095 carbon steel. The carbon steel knives are made by using the stock removal method. Only natural materials are used to create the handles. The Damascus knives are all hand forged one at a time. I use two different combinations of carbon steel – 1095 + 01 and 1095 + 15N20. Damascus knives will have from 200 to 500 layers of steel. To create the Damascus steel, a gas forge and 50 lb. trip hammer are used to weld and fold the layers of steel together. After forging, grinding, and polishing the metal is etched to bring out the beautiful grain patterns of the steel.